Comet Elenin as seen by NASA's STEREO spacecraft on Aug. 6, 2011. A NASA spacecraft aimed at the sun shifted its unblinking gaze to an approaching comet last week to snap a new photo of the icy object as it flew by. The image shows the comet Elenin as it passed within 4.3 million miles (7 million kilometers) of one of NASA's twin Stereo sun-watching spacecraft during a series of deep space photo sessions that began on Aug. 1. NASA rolled the Stereo-B satellite to give its instruments a view of the comet flyby, officials said. "From August 15 onward, the comet enters the HI-1 telescope's nominal field of view, at which time we should enjoy continuous viewing of the comet," NASA researchers explained in an update posted to the Stereo mission website. Comet Elenin is expected to become brighter over the next few days, and could be detectable using Stereo's coronagraph instrument between Aug. 20 and Sept. 1, NASA officials said. Mission managers are then expecting the comet to become visible to another sun-watching spacecraft – NASA's Solar and Heliospheric Observatory (SOHO) – for six days, beginning on Sept. 23. Comet Elenin was discovered in December by Russian astronomer Leonid Elenin, who spotted the icy wanderer using the International Scientific Optical Network's robotic observatory near Mayhill, New Mexico. 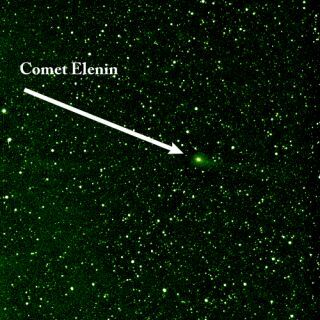 Comet Elenin will fly through the inner solar system in October 2011 and be 22 million miles (35 million kilometers) away at its closest approach to our planet, NASA scientists have said. The comet is not expected to be particularly dazzling, but the flyby may be a good chance to study a relatively young comet from the outer solar system. Some doomsday theorists have pinned the Nibiru rogue planet hypothesis on the small comet. Conspiracy theorists say a planet, known as Nibiru, will swing in from the outskirts of our solar system and collide with Earth and wipe out humanity in 2012. Since no rogue planet has been found in the outer solar system, some people have argued that comet Elenin will be the true culprit in the Nibiru-Earth collision. NASA has dismissed the notion that comet Elenin is anything other than a dim, wimpy comet. It poses no threat to Earth, making its closest pass at a distance roughly 100 times farther than the distance from Earth to the moon. NASA's identical twin Stereo spacecraft were launched in October 2006. They are offset from one another, one flying ahead of the Earth and the other behind. The name "Stereo" is short for Solar Terrestrial Relations Observatory.